What Exactly Is It That Defines Hair As Being Fine Textured? How do you tell if you have fine hair? What Features Make a Flat Iron Ideal To Use on Fine Hair? Are you frustrated because every time you go to straighten your fine hair you tend to damage it a little? It certainly is one of the most difficult types of hair to straighten because it’s heat sensitive. So what are you supposed to do if you want your fine hair straightened? One of the choices is to get the best flat iron for fine hair that you can buy. These flat irons are full of features that are conducive to straightening fine hair without damaging it. We will help you learn how to go about finding the perfect flat iron to straighten your hair with. This will be done through such means as doing some flat iron for fine hair reviews. We will also be giving you other helpful information about what features make a flat iron great to use on fine hair. When you are done reading this article you will have a really good idea of what type of flat iron you want to buy to use on your own fine hair. Here is a flat iron from ghd that is great for using on fine hair. The highest of its 3 heat settings is only 365ºF so it won’t damage your fine hair if you use it properly. It also has ceramic coated heat plates that tend not to form hotspots that damage your fine hair. Your hair will also slide across the ceramic coating very easily as you use this straightening iron. There are some other nice features on this flat iron too. These include its unique and stylish gold accented look and its lightweight body style that stays cool as you use this hair straightening tool. It even has a dual voltage capability so you can use it anywhere you travel in the world. Lower temperatures are your friend when it comes to straightener fine hair and that is exactly what this flat iron gives you. The temperature you use it at can be digitally set anywhere from 300°F – 430°F. Fine hair straightens easily and tends not to be damaged when straightening it at the lower end of this temperature range. Other nice features on this flat iron include such things as a rapid 30-second ready to use time and its 15-minute auto shutoff timer. It even has avocado and vitamin E infused ceramic heat plates to nourish your hair as you straighten. 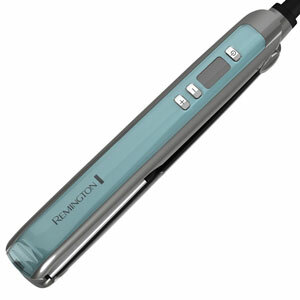 Remington also backs this flat iron up with a full 4-year warranty. Paul Mitchell is a big name when it comes to hair styling tools that work well and this flat iron from them does not disappoint at all. This straightening iron is gentle on fine hair because it uses this company’s own Express Ion Complex™. It’s a heat plate coating that heats up evenly so there are no damaging hotspots and it helps your delicate fine hair retain its moisture better during the straightening process too. It also features the ability to protect your fine hair when straightening it by using a heat setting as low as 250°F. The beveled edges and cushioned ceramic heat plates are easy on your hair and keep it from getting creases as you straighten it too. You can even take this flat iron with you as you travel overseas thanks to its dual voltage capability. xtava makes some excellent heated hair styling products and this flat iron is one of them. It’s a straightening iron that won’t damage your fine hair when you use it because it can be set to a temperature as low as 265ºF (10-setting choices from 265ºF to 445ºF). Settings in the 265ºF to the 300ºF range are recommended by stylists when you are straightening your fine hair. The temperature is not the only thing this well-designed flat iron has going for it either. There is also its gentle far-infrared produced heat and its 2-inch wide heat plates that work great on longer hair. 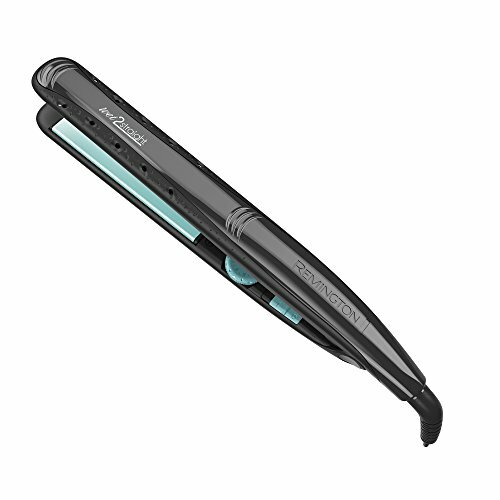 This flat iron even has a built-in universal dual voltage capability. If you want to straighten your fine hair in style then this is the flat iron for you. It has a unique and vibrant purple color. What makes it even more special when it comes to straightening your fine hair is its wide 180ºF to 460ºF. That makes it very easy to find a lower heat setting that will straighten your fine hair without damaging it. Other nice features on this straightening iron are its big surface area 1 ¼” floating ceramic plates and its 8-foot long power cord with swivel end that promotes a wide range of easy movement when using it. 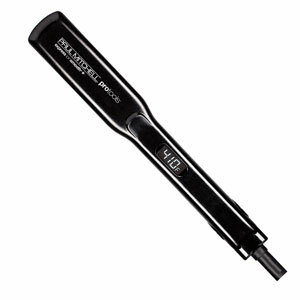 This flat iron has dual voltage capability too so you can take it anywhere you travel. There are very few flat irons that you can use on wet hair but this is one of them. This Remington hair straightening tool has a unique venting system that allows steam to escape as you straighten your fine hair so it does not damage it. So you can go right from the shower to straightening your hair in no time. It also features a wide range of heat settings too. There are 30 in all that range from 300ºF-400ºF. The lower of these heat settings are great to use to straighten your fine hair. 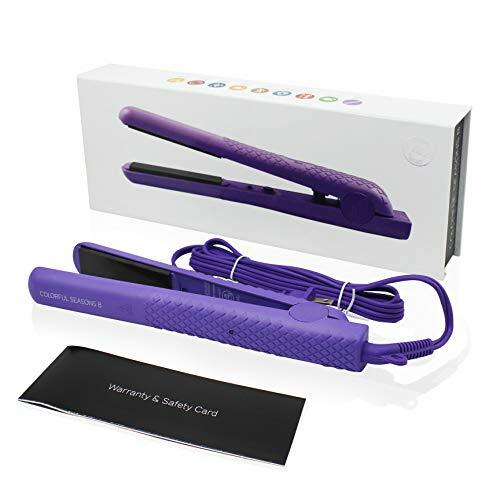 It also has versatile 1″ ceramic titanium heat plates which are great for straightening both long and short fine hair. The width of individual hair strands are usually termed as fine, normal or coarse. If you truly have fine hair it’s important to know this when you go to straighten it. That is because people with fine hair have to be very careful when using a flat iron to straighten it is because heat can easily damage it. Why is fine hair more fragile than other width hair types? It’s because of the nature of its cellular makeup. Thin hair is not as thick as normal or coarse hair because it has one less piece of cell structure than them. Normal and coarse hair cellular structure includes what are known as the cuticle, cortex, and medulla. The medulla is the part of cell structure that is missing in fine hair. How do you tell if your hair is fine, normal or coarse? There is a simple test you can do to determine this. Start by pulling a strand of hair out of your head. After you have done that place that strand of hair in a pincer grip between your thumb and forefinger. Once that is done, then pull the strand of hair out from between your thumb and forefinger. If the strand of hair slides out easily and you don’t feel it you are said to have thin hair. If you feel that hair strand a little when you pull it and it has slight resistance you most likely have normal hair width. When you pull the hair strand out from between your thumb and forefinger, if there is a lot of resistance and you feel it strongly then you most likely have coarse hair. One of the biggest sources of confusion, when people define hair types, is the difference between fine and thin hair. Many people wrongfully consider them to be one in the same but they are distinctly different in reality. It’s important to get these two hair defining terms straight in order to choose the right flat iron for your straightening needs. Why is thin and fine hair not the same? It’s because they deal with two vastly different hair traits. Fine hair has to do with the width or diameter of your individual hair follicles. Thin hair has to do with the combined follicle density of the hairs all over your head. So as you can see they are separate and very distinct from each other. Unfortunately not every flat iron made is a good choice to use on your fine hair. There are certain characteristics a flat iron must have in order to straighten fine hair well and more importantly not damage it. If you pick up a flat iron and set it on a 400ºF plus heat setting you can pretty much bet you will damage your hair. That is why it’s critical that any straightening iron you use on fine hair have some lower range temperature settings. The importance of this cannot be stressed enough if you are using a flat iron on your fine hair. So what is an ideal temperature range for straightening fine hair? It should start at somewhere between 200ºF-300ºF. So look for a flat iron that has temperature setting choices in this lower heat range. The more choices of lower range heat settings your new flat iron has the better. Keep in mind that any of these heat plate coatings or crystalline heat plate infusion types can be used in combination with each other. The more of these coatings and crystal infusion types that you have on your new flat iron the better it is for your fine hair. Owning a flat iron that has heat that is produced by far-infrared means is a big bonus too. This is because far-infrared generated flat iron heat is very gentle on fine hair. This is because it heats the delicate fine hair strands on your head from the inside out. Hair strands heated up this way are much less susceptible to heat damage. 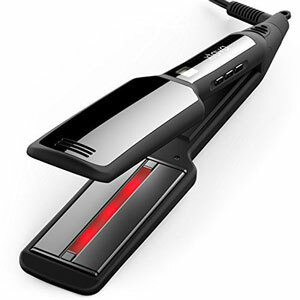 Far infrared heat is definitely the means of heat generation you want to have on your flat iron if you have a choice. So be sure to consider highly any flat iron that you are thinking about buying that has it. This size flat iron heat plate width is the only way to go if you want to straighten shorter fine hair. It’s also a great choice if you want your flat iron to double as a curling iron. Versatility is the name of the game here. This is a good choice for medium length hairstyles but it can also handle some shorter and longer hairstyles too. It’s a good default choice to start out with too if you are unsure what size heat plate width will work best for you. If you have longer hair you definitely want to have a wider width heat plate size on your flat iron. More surface area is the key here and that is exactly what you get with a wider flat iron heat plate width. Do you like to get ready fast in the morning and that includes some hair straightening? Then you may very well want to consider a wet/dry flat iron that is vented. 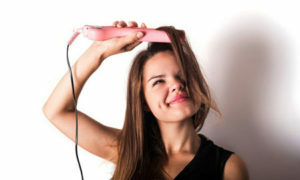 It is the only type of flat iron that is recommended to use to straighten wet hair. That is because trapped steam can fry your hair in a hurry if you are not careful. The vents on this type of flat iron do not allow steam to build up as it will easily escape out through them. There are a few convenience considerations to consider when purchasing a new flat iron to use on your fine hair too. These include such things as long power cords with swivel ends, digital heat setting with LCD displays and automatic safety shutoff switches. Never straighten your hair when it’s wet unless you have a vented flat iron. Steam buildup can easily damage fine hair. Add protective oils or serum before starting to straighten your hair with a flat iron. Ask your professional stylist what they recommend. Use a lower heat setting. Fine hair is very responsive to even lower heat settings so no need to use the max heat setting on your flat iron. Don’t go over the same spot on your hair too many times. This will tend to build up the heat to a damaging level. Question: Are there times when I need to use a higher heat setting on my fine hair to straighten it? Answer: Anything is possible but this is not very likely to be the case. Even if you think you need a higher heat setting to straighten your fine hair do it smartly. The way to do that is to start out on lower heat settings and gradually work your way higher. Stop increasing heat when you get to a setting that straightens your hair well without damaging it. Question: I have a brand of flat iron that has no heat settings. Is it ok to use on my fine hair type? Answer: I would really not recommend this and here is why? Flat irons that have no heat setting choices on them typically will automatically heat up to over 375ºF. As we have said repeatedly in this article that is a higher heat range than we feel is safe to straighten fine hair at. You can find budget-friendly flat irons that have lower heat settings on them. I would stop using that flat iron model you currently own on your fine hair and purchase a new one with low adjustable heat choices. If you are looking for a professional solution, then you can check out the best selling flat iron reviews here! Without a doubt, fine hair can be very hard to straighten without damaging it. That is what makes the best flat iron for fine hair an essential part of any fine hair straightening process. The importance of using the right flat iron for your fine hair cannot be stressed enough. Failure to do this can really leave your fine hair over dried and damaged. We have tried to help show you what’s important to look for when purchasing a new flat iron to use on fine hair. Do yourself a favor and use this advice as a guideline. We have also tried to eliminate the stress of shopping for a new flat iron by doing a series of flat iron for fine hair reviews. Anyone of these flat irons will do a nice job straightening your fine hair without damaging it. Either way, you are now armed with the means to make a sound flat iron for fine hair buying decision.